Definition - What does Ardha Chandrasana mean? Ardha chandrasana is derived from the Sanskrit ardha, meaning "half," and chandra, meaning "moon," and asana meaning "seat" or "posture." This is a graceful, balanced pose which mirrors the image of the half moon in the sky and awakens the opposing sides of the physical body. To enter this pose, one starts with a wide stance, bends the torso toward one leg and places the hand on the same side on the floor; then the opposite leg is extended fully to the side while the arm on the same side extends fully above the body. Ardha chandrasana is also referred to as half moon pose. 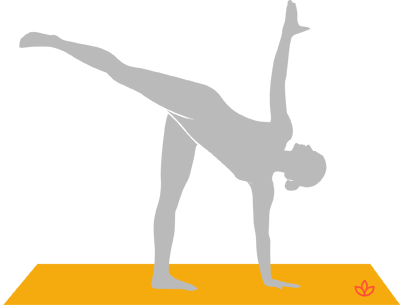 Ardha chandrasana pays homage to the celestial half moon shape. Just as the half moon reveals a perfect balance between the moon and the sun, ardha chandrasana balances the body with the lateral extension of the leg and torso. Ardha chandrasana benefits the mind and body in a myriad of ways as it strengthens the core and coordinates alignment. In this pose, energy from both sides of the body is awakened and brought into harmony.